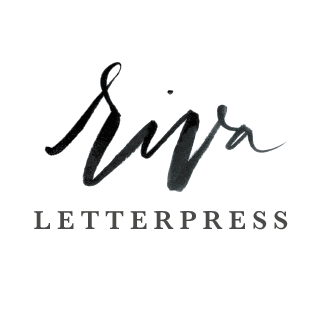 Elizabeth Riva (pronounced like "Diva" but with an "R") started Riva Letterpress as a custom printing business in San Francisco as a way to escape the monotony and snooze fest of working in the financial world after college. She took her creative passions a different direction from Wall Street and shifted to exploring the art and printing world. After falling hard for letterpress, she learned the odds and intricacies of old, hand fed presses, and started creating one of a kind, light hearted, cheeky letterpress greeting cards. Illustrations are made a little tongue and cheek all while poking fun at motherhood, memories of growing up in the 80s and a heavy dose of food puns. Our purpose in this creative endeavor is to spread some chuckles and try to not take life so darn seriously. Seriously.